Holly Black invited Maddy to a screening of The Spiderwick Chronicles last night, and I drove her and her friend Anna-Rose, and went in with them as one of Maddy's "plus two". (I skipped out on seeing Hannah Montana 3D last week when I did chauffeur duty, and sat in the next door Starbucks and wrote The Graveyard Book instead, and it was only when the girls came out that I learned that it had the 3D Coraline teaser before the movie.) Anyway, I really enjoyed TSC, much more than I thought I was going to from the teasers they showed at San Diego, and tried to get Maddy to review it here ("Da-aad. Just say Maddy really liked it.") and then to get Anna Rose to review it here ("Er. Just say that Anna Rose really liked it."). So no review, but Maddy and Anna Rose really liked it. I searched your site, but saw no mention of the upcoming Sandman and Death bookends. 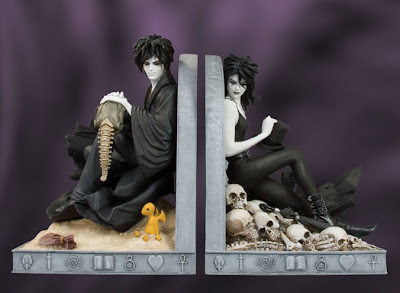 I love most of the Sandman statues, and these look really cool, so I will probably pick them up. My question is, is this replacing the large slipcase designed to hold the 4 absolute Sandman volumes that you have mentioned in the past? If the slipcase is still planned, will it be able to contain the individual slipcases as well, or just the books? On another note, is there any truth to the rumor of an Absolute Death collection to accompany the Sandman volumes? Thanks for the writing, and for the blog. The DEATH volume won't be an absolute. It'll be oversized, though, in the Deluxe Edition format, and probably be called THE COMPLEAT DEATH because that's what we've been calling it for the last decade. You probably already know it...I'm just making sure. Also, while I don't usually like book reviews...when I was in high-school, I knew synesthesia and the Midgard serpent. I also knew Mandelbrot (if only as "that guy who makes math into freaky pictures"). Admittedly, I've always been a little weirder than most people. I've never posted Lolthulhu, have I? Despite people letting me know about it as long ago as last Hallowe'en. Well, it's up now. Hey Neil...since you seem to be always open to nifty, original websites, I found one that I think is splindifferously wonderful. This guy takes drawings done by children and recreates them in photographic form. It really goes to show both the photographer's ingenuity, and more importantly, the creativity of children's minds. WONDERFUL site. I hope you like it.